Bina007 Movie Reviews: X-MEN: FIRST CLASS - Gentlemen, you can't fight in here: this is the war room! X-MEN: FIRST CLASS - Gentlemen, you can't fight in here: this is the war room! I have always been rather conflicted about the X-MEN movies. On the one hand, I found the comic book tale of mutants, whose mutations had the appearance of superhero powers, rather confused and illogical. In a cosmic tale of "scissors-paper-stone" how was I to know whether a particular mutant's ability to whip up a storm could be trumped by another mutant's ability to throw fireballs? It all seemed too easy for the writers to whip up a deus ex machina. On the other hand, I absolutely loved the profundity of the intellectual debate at the heart of THE X-MEN. The comic books served as a plea for the acceptance of "freaks" - and for mutants one can read those who are sexually or racially oppressed in real life. The real battle was not between humans and mutants but between Professor X and Magneto. Professor X believes mutants can "be the better people", helping humanity, even though humanity is not always supportive of mutants. By contrast, Magneto believes that humanity will inevitably hunt what it fears and fear what is different. Mutants should therefore go on the offensive. This is the debate between Dr King and Malcolm X - the language of acceptance and self-hatred - the conflict between appeasement and aggression. The great news is that X-MEN: FIRST CLASS, by taking us back to the origin story of Professor X aka Charles Xavier and Magneto aka Erik Lensherr, really delves into these issues. For the first time in the franchise, I really felt as though I had equal sympathy for both sides (rather than disdain for Magneto), and felt the emotional conflict that ultimately ripped these two friends apart and led Xavier's adopted sister Raven/Mystique to leave him for Erik. I can't say enough about James McAvoy and Michael Fassbender's nuanced and emotionally affecting performances as Xavier and Erik respectively. I truly believed in their friendship between opposites - the little boy who grew up amidst great wealth and led a sheltered life at Oxford befriending the angry, tortured soul, brutalised by the Nazi scientist Sebastian Shaw. And Jennifer Lawrence, given far less to do than in her Oscar nominated role in WINTER'S BONE, brings real depth to her performance as Raven - the girl who cannot hide her mutation in plain sight and has self-esteem issues that any teenager can relate to. Because you care about these people, your perception of the stakes shift. Every good action movie needs you to feel the stakes to make you care. But the stakes here aren't stopping Sebastian Shaw from inciting the USA and Soviet Union to turn the Cuban Missile Crisis into Nuclear War. (Although these serve as an amazing setting for the final action set-pieces and made me wish Matthew Vaughn could direct a James Bond movie starring Michael Fassbender). No, the real stakes are whether the disagreement between Magneto and Xavier will destroy their friendship and tear apart the mutant family. All of which makes the movie sound rather ponderous, but that really isn't the case. It is intelligent, yes, and takes its material seriously. But it also has a sense of wit and, even cheekiness! What I really love about Matthew Vaughn's direction is that he takes the 1960s Cold War setting and really mines it well, with production design that has an air of those early Sean Connery Bond films and costumes for January Jones' that are practically Austin Powers-esque. I mean, we have January Jones (Emma Frost) in fem-bot spangly bikinis; an urbane Bond-like action hero in the form of Fassbender's Erik; and Kevin Bacon is pure Blofeld, with his double-breasted suits, yachts and obsession with atomic energy. Other comedic touches included a training montage of the type spoofed in TEAM AMERICA: WORLD POLICE, that stays just the right-side of camp. A set-piece with the mutant kids showing off their skills that involves a choreographed move that feels like SCOOBY-DOO. And when the action set-piece reaches its climax, with Erik pulling off an amazing feat, we get a soundtrack that comes straight out of TOP GUN. Not to mention the war-room looking like something out of STRANGELOVE! 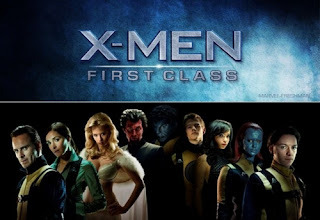 The genius of X-MEN: FIRST CLASS is, then, that it combines the intelligence of Jane Goldman, Ashley Miller and Zack Stentz's script with the pop-culture sensibility of director Matthew Vaughn. It's a movie so earnestly in love with the comic book material and its cinematic antecedents, that it can be intelligent but also witty - it can be self-referential (viz. the Hugh Jackman cameo) but never kitschy. I truly think this is a great summer blockbuster - and is far more entertaining and quietly clever than INCEPTION ever was. It has restored my faith in big summer action movies, after the disappointment of PIRATES 4 and THE HANGOVER 2. I can't wait for the next installment! X-MEN FIRST CLASS is released today in the UK, Denmark, France and Serbia. It is released on June 2nd in Argentina, Australia, Hong Kong, Hungary, Israel, Kazakhstan, Malaysia, the Netherlands, Portugal, Russia, Singapore and Thailand. It is released on June 3rd in the US, Brazil, Canada, Colombia, Estonia, Finland, Iceland, India, Norway, Paraguay, Poland, Spain, Sweden and Turkey. It is released on JUne 8th in Italy; on June 9th in Germany and Greece; on June 11th in Japan; on June 18th in Armenia and on June 23rd in Georgia. I hated this movie. Won't bother explaining why, but I'll just say that I dislike almost all comic superheroes. Batman and The Shadow are the only characters I ever actually found interesting. As for X-Men, I agree that the arbitray nature of their powers is extremely annoying. You always have the feeling that at any moment they'll stumble across another mutant who just so happens to be able to turn himself into doorkey at just the moment when they need a doorkey. But may I ask a question as I'm vexed: am I right to feel sympathy for otherwise excellent actors like Fassbender who slum it for sacks full of money in rubbish like X Men? I saw Hunger for the first time a few months back, after I'd seen him in Inglorious Basterds, and thought he was magnificent - an actor to watch and admire. Then, today, I go watch this film and find him stomping about in a dodgy leather jacket with a bucket on his head being all menacing-like. I felt embarrassed for him. But he's a grown man who made a conscious decision to be in this stuff. So he surely doesn't deserve any sympathy, and nor would he ask for it, I'm sure. So then why do I feel this way?! By the way, can't believe you thought Vaughn's direction was adroit in any way. I think he's a hack in the truest sense. Like that Zack Synder character, it's all shallow imitation of films their favourite movies, punctuated by booming soundtracks and oh-so-serious furrowed brows for the fellas and squinting for the gals.